The might of the Mongol military was vast and their army was huge, comprised of many skilled warriors. This size meant that organisation was key, and the Mongols had structures and hierarchies to manage their huge resource of warriors. At the top of the chain in the Mongol military was of course the Khan. Ruler-ship and order would be passed down to sub ordinates and unit commanders. The unit commanders would have their work cut out too, the Mongol units would grow to 10,000 men strong. At this size the unit was known as an Tumen and was the largest known size. Of course this was not the final size of the Mongol army at its peak, but many of these Tumens would combine to form an Ordu a group of Tumens in unison providing up to 100,000 Mongol warriors, a truly fearsome thought. Of course for the Mongol military to grow to this size was a feat in itself, and this feat was largely the creation of the Mongols first and most prolific leader, Genghis Khan. Genghis did not only think he we a born leader, he actually was. The use of Chinese military tactics and personal skill leaned over years of training allowed Genghis to help assemble the highly successful Mongol army, assigning suitable responsibility to those around him. The Mongol empire was ruled by its nobility, headed up by the first great leader, Genghis Khan who obtained the position of Great Khan. The Khagan was the king of kings in the Mongol empire, the great ruler of the people. Genghis Khan was the first Khagan, and the difference here from a Khan, is that a Khagan is from the lineage of Genghis, any other ruler would simply be a Khan. 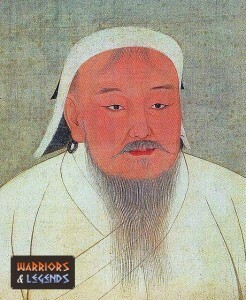 Ghengis Khan, the highest ranking member of the Mongol military, a Khan. Khan in the Mongol empire and military essentially meant king, and while this marked the Khan out as royalty and nobility, in the times of the Mongols this meant they were also a fearsome warrior. The Ilkhan was ruled by the Khan and tasked to oversee smaller regions of the empire. In this way the Ilkhan were governed of various provinces and regions, answering to the Khan and helping to maintain and grow the empire. The Boyan was the general to the Khan, and also given an Ordu to command. It was not required of the Boyan to be a blood relative of the Khan like some ranks. The Yurtchi would be the caretaker or quartermaster for an Ordu. This role would require the Yurtchi to manage, organise and perform many daily duties to keep an Ordu running smoothly. These duties would include organising food and drink, equipment, swords and the horses among other jobs. The Yurtchi was essentially a chief of staff in the Ordu, and a very important role to the Khan, as the Yurtchi would control the stock of Mongol weaponry. The often complex and intricate Mongol army had a multitude of rankings, all focused on managing an ever increasing group of warriors. An Orlok was in charge of an Ordu, a unit of over 30,000 nokud or more. A Tumetu-iin Noyan was in charge of a Tumen, a unit of 10,000 nokud. A Minggan-u Noyan was in charge of a Mingat, a unit of 1000 nokud. A Jagutu-iin Darga was in charge of a Jagun, a unit of 100 nokud. A Arban-u Darga was in charge of an Arbatu a unit of 10 nokud. The Cherbi was the supreme commander of a special Mongol warrior unit known as the Kheshig. This unit were essentially a group of bodyguards for the Mongol royalty, an imperial guard unit of which the Cherbi commanded. The Bahadur were the noble Mongol warriors and would likely be drafted into the imperial guard and assigned with a uni like the Kheshig or being involved in that area. The free warriors of the Mongol army, the Mongol warriors themselves were considered a nokud for example. Under the rule of Genghis Khan the Mongol army took a much more structure and unified shape. The previous broken tribes and groups were replaced with a more rigid military system that focused on multiplications of ten to scale their military units. It’s interesting to note that the units share a similar naming structure to the commanding warriors assigned to them. There were also specialist units within the Mongol military, units that had specific purposes outside of the normal formations. One of these unit was the Kheshig an elite bodyguard unit of the Khan, who Genghis often just referred to as his guard. The Kheshig were an imperial guard unit, specially assigned to protect Mongol royalty. Their job would be to watch over the Mongol Khans night and day, and this unique unit were split into two shift groups to satisfy this need. The Kheshig would be comprised of nobility and nokuds, as long as a warrior had proved himself to be capable he would be considered. Genghis was famed for even letting soldiers from conquered armies join his guard, and perhaps it was this trust that made Genghis such a great and respected leader. Joining the Kheshig was thought to be one of the highest honours to any Mongol warrior, and would often lead to greater things. Many of the Kheshig would be promoted to control large units, provinces and even regions in the Mongol army. An Artbatu was a group of 10 warriors. The smallest unit in the Mongol army this group would be run by a Arban-u Darga. A Jagun was a group of 10 Artbatus(10 Mongol warriors) to come to a total of 100 warriors. This unit would be headed up by a Jagutu-iin Darga. A Mingat was a group of 10 Jagun(100 Mongol warriors) to come to a total of 1000 warriors. This unit would be lead by a confident and savvy Minggan-u Noyan. A Tumen was a unit of 10 Mingats(1000 Mongol warriors) to come to a total of 10,000 warriors. This the largest Mongol unit would be lead by an experienced Tumetu-iin Noyan. The Ordu was the culmination of many Tumen(10,000 Mongol warriors) to come to a total of up to 100,000 warriors, but could range from three Tumen up to ten and more in some cases. This powerful and mighty group would have been led by an Orlock, thought to have typically been a noble and from the family of the Khan. It is obvious that the Mongols were serious about their military and warfare. The structure of their army was designed to offer a chain of command and a structure that worked for the vast size of their army. With the Great Khan ruling over, the Ilkhan would be tasked with regional management and the rest flowing down. Regardless of the organisation the most important component and the base unit for the mighty Mongol army was however the Nokud, the skilled Mongol warrior.